This recipe marries the sweetness of mussels with tangy pecorino and a hint of garlic to create a dish that is subtly different from the more common pasta alle vongole (with clams). I first tasted it in Naples, where the pasta served at the fabulous Trattoria Manfredi was scialatelli, somewhat like spaghetti but shorter and thicker. 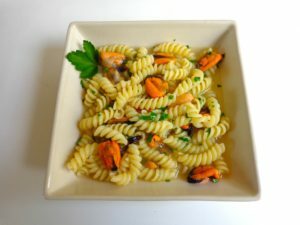 As scialatelli are not easily available in Paris, I substituted the twisty pasta known as girandole, similar to fusilli. In fact, any kind of pasta will do — the trick being to cook it only until it is just al dente because it will cook a bit more in the broth from the mussels. Use fresh mussels in their shells for this recipe; frozen mussels will not work. You can keep fresh mussels in the fridge for a day or two before cooking them provided they are in an uncovered recipient, preferably of ceramic or glass. As for the pecorino, which is traditional but may be hard to find, parmesan makes a perfectly acceptable substitute. Please note: the quantities below are approximate. You can use more pasta for hearty eaters, or fewer mussels if you prefer. Immerse the mussels in cool water for about 20 minutes — this will make them less salty when cooked. Then remove the beards, transferring the mussels one by one to a colander and discarding any that are chipped or broken. When finished, rinse them thoroughly. Peel and mince the garlic. Chop the parsley. Grate the pecorino, using the tiniest holes of your grater. Set aside. Melt the butter in a large pot. Add the olive oil and garlic. Sauté briefly, then toss in the mussels. Add the white wine. Cover tightly and cook over medium-high heat just until the mussels open, about 5 minutes, checking from time to time. For maximum tenderness, do not overcook. Turn off the heat and remove the cover to let the mussels cool. Bring a large pot of water to a boil. Important: do not salt the water, as the mussels are already salty. Add the pasta and cook until it is just al dente, about 1 minute less than the time specified on the pasta box. Drain and set aside. When the mussels are cool enough to handle, remove them from their shells, placing them in a small bowl. Pour the mussel broth through a strainer into a large saucepan. Reheat gently. Add the pasta to the warm broth. Add the mussels and chopped parsley. Simmer for about a minute. Add the grated cheese. Ladle into shallow bowls, including a little broth. Serves 2 as a main dish, 3 as a starter.